Lovely outline, well balanced throughout with a kind expression, well angulated shoulders, good bone & feet, excellent spring of rib and level topline, strong hindquarters, moved, showed and handled well, in good coat. 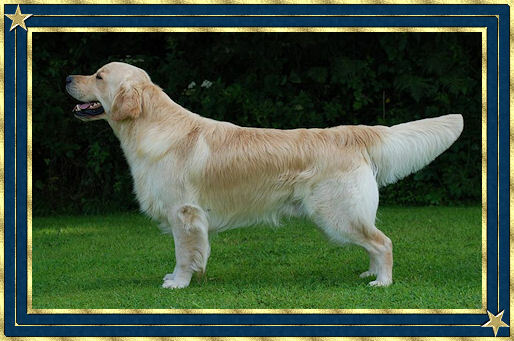 Quality mid gold dog of lovely type, sound construction, such a showy dog, free stood on a loose lead, he never stopped wagging his tail, moved well, nicely presented. Very typical, stylish outline on this lad, shown on a loose lead with constant wagging tail, lovely chiselled head, dark eye and pigment, good length of neck, good lay of shoulder and strong level top line, excellent condition, liked him a lot, very animated and good sound mover. 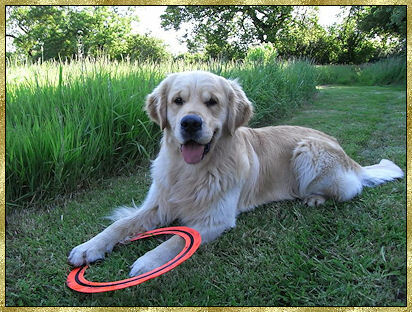 Lovely mid gold boy. Well constructed throughout, balanced head, kind eye, good expression. In excellent coat and condition. Lovely level topline and tailset held on the move. Has a bright future. Nice type, handler knows how to get the best out of this very balanced boy. Very honest dog with nothing exaggerated, balanced head, dark eye with soft expression, straight forelegs, correct bone, good reach of neck, well laid back shoulders. Short coupled, correct hind angulation, straight when viewed from behind and on the move, sound steady mover. Looking just right for age in full golden coat, pleasant masculine head, dark eye and pigment, correct quarters, level topline, moved well, handler getting the best out of him. Berkshire Downs and Chilters GRC. Close decision between 1 and 2. Gentle head and expression, moved very soundly. Judge: Mrs. Heather Morris (Sandusky). Results: 3rd Yearling dog (Class of 31 entries). Another one moving so well and showing a very balanced outline, free shown to advantage and very responsive to his handler. Therefore qualifying for Crufts 2010. Results: 1st & BOB in Post graduate. Results: 3rd in Yearling. Therefore qualifying for Crufts 2009. Judge: Mrs L. Flintham (Flinasia).